It is officially fall. I’m one happy camper (pun intended). Now that it is fall a lot of American Heritage Girls troops are planning campouts. I have decided to devote the next couple of Friday posts to camping. Requirement #14 of the Outdoor Cooking merit badge has the girls create foil meals. This is one meal that works well for the entire group – regardless of which ages are camping. I set up an assembly line and allow the girls to prepare their own meal. Cooking on the coals of a campfire can be a little tricky, and takes practice. It is important to get the fire down to the coals. The foil packs need to be placed so they receive indirect heat. Where they are placed within the fire pit will greatly affect the outcome. 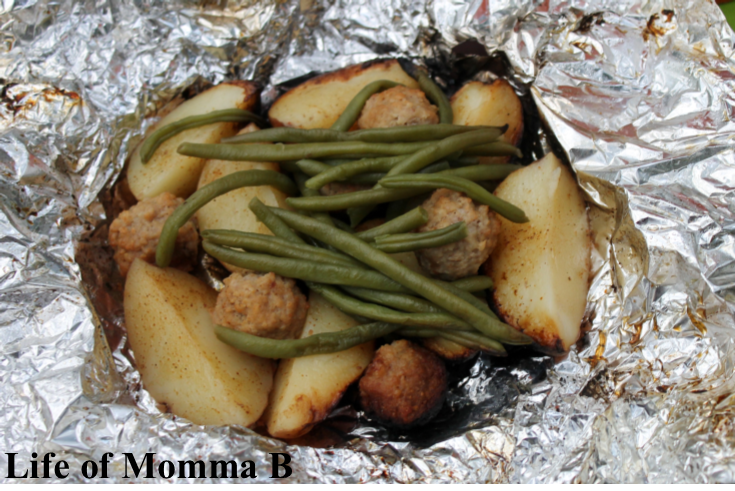 The foil meal pictured above includes new potatoes, meatballs and green beans. I add season salt to add a little flavor. The combinations are limit-less. When planning the campout allow the girls to pick their favorite vegetables to use. Carrots are a great option, along with bell peppers and onions. Corn on the cob will work if cut into 1-inch rings. I try to stay away from green peas and other small items. I use pre-cooked meatballs (yes, store-bought ones are ok too, but these taste much better). I do not want to risk under-cooked meat. After the meal is assembled, use a permanent marker to write the girl’s name on the foil packet – before it goes into the fire. Allow them to cook for 20-30 minutes. Each girl then has her own meal with the vegetables and amounts she likes. This entry was posted in American Heritage Girls, Recipes and tagged AHG, beef, camping, green beans, main course, merit badge, Outdoor Skills Frontier, potatoes. Bookmark the permalink.